Yes, we’re talking about headship & submission again. If you’re like me and you’re starting to scratch your head about why this is coming up so much on the blog lately, it’s ultimately because October was “Domestic Violence Awareness Month.” Because of that, this season always brings a fresh round of blaming God’s Word for abuse, which consequently produces a lot of occasions for defending Biblical teaching on headship & submission. I’m not widely read in this area. I guess the thing for me is that dudes who talk a lot about headship in the first place make me skeptical. To adapt Margaret Thatcher, being head of home is like being a lady: if you have to tell folls you are, you aren’t. This is one of those comments that’s technically true, but nevertheless misses the point entirely–and can cause a great deal of harm as a result. There is a lot of merit to Thatcher’s proverb, and I really do think one can make a proper analogy to headship. But to really understand that analogy, one also has to consider the exceptions to the proverb. And don’t be deceived by the word “exception” into thinking they must therefore be a small and insignificant matter. That’s the thing with analogies–what might be exceptional on one side of it may not be so on the other. And in a culture that has shifted as radically as ours has, many things that were once exceptions have become commonplace. So what do I mean by exceptions? Well, try to imagine a situation in which a genuine lady might actually feel the need to remind someone of her station: for example, when she’s cornered by a brutish cad who wishes to treat her like a prostitute rather than a lady. She might very well say something along the lines of, “Get your hands off of me! I am a lady!” (Read that in your head with a English accent, and you’ve got it.) The actions of this lout don’t erode her character or make her unladylike, nor do her objections to that behavior. In such a context, what she says is a reminder to him that because of who she is, what he wants is beneath her. The problem is not with her, but with the cad who acts contrary to all good sense and propriety. There is an analogous situation when it comes to headship–a situation that has become more common than many are willing to admit in the feminist West. Consider a husband who is cornered by a quarrelsome wife (i.e. 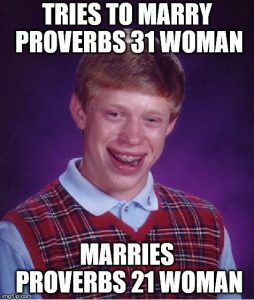 the Proverbs 21 Woman). She does not wish to treat him as a husband, but as a servant and a resource. In her open rebellion against both her husband and her God, she takes “if mama’s not happy, ain’t nobody happy” as a mandate to usurp headship over the household. She has the threat point of unilateral divorce on her side and no compunctions about using it and taking away his family should she become sufficiently unhappy. From within the misery of such a situation, the husband might very well feel the need to speak up and remind her of his God-given station. However, as with the lady cornered by the lout, the problem is not with him, but rather with the shrew who acts contrary to all good sense and propriety. It’s true enough to observe that the husband of such a woman won’t make any progress by reminding her of his headship–as I’ve written before, if she cared enough about what he (or God) said to take it to heart, she wouldn’t be quarrelsome in the first place. But really, that’s not any different from the lady cornered by the cad. He is already beyond all good sense and so cares nothing for her objection. If she is to escape, it’s only because either somebody else intervenes on her behalf or because the lout knows that somebody eventually will intervene if he goes too far. But this, too, teaches us some important lessons about the modern headship situation. The first lesson is this: if one encountered the lady cornered by the cad and heard her object that she’s a lady, who would be so cruel as to sneeringly inform her that “if you have to tell folks you’re a lady, then you’re really not one” before abandoning her to her fate? And yet, that is precisely what so many conservative Christians do when they hear someone speaking Biblically about headship. It’s already presumptuous to assume their situation, but even in cases where the presumption is correct, consider this: Yes, the guy who has to complain about headship because of his own situation isn’t really head of his household in practice. But he’s probably already keenly aware of that fact and likely ashamed of it to boot. So why on earth would any decent person ever add insult to injury by rubbing his nose in it? Going back to the analogy, if phrases like “I’m a lady” or “you should treat her like a lady” are to have any meaning at all–if anyone were motivated to actually intervene for the lady’s sake–it is because a multitude of people other than the lady in question talked about what it means to be ladylike. When she grew up, her parents modeled for her how a lady acts and how a gentleman acts around ladies. They warned her when she was being unladylike and encouraged her to act in a proper way. Her social institutions like her schools and churches all reinforced those same notions of proper behavior, as did most of her peers. Men likewise were taught how to recognize ladies and respect them accordingly. And when people deviated from those norms, the rest of their society held them in lower esteem as a result. A lady might not need to assert herself as a lady, but apart from a society in which lots other people have talked a lot about being ladylike, Margaret Thatcher’s proverb would be gibberish. So if a husband shouldn’t be always insisting on his own headship (which, again, is pretty sensible when it comes down to it) then it falls on lots of other people to talk about headship so that he doesn’t have occasion to. Doing so is a net positive when it comes to abuse as well, because if headship were to become so well defined and understood in our culture that there was no real need to assert it, it would also be that much harder to use as a cover for abuse–people will know what it’s for and what it isn’t for. In contrast, it may be that if we become reflexively skeptical when people talk about headship a lot, we’re actually more skeptical of the Biblical teaching than we’d like to admit. This entry was posted in Culture, Feminism. Bookmark the permalink. One Response to Should Talking About Headship Make Us Skeptical?